Positive news is coming out of Mayo Clinic for women with dense breasts in the constant battle for early detection of breast cancer. A new breast imaging technique pioneered at Mayo nearly quadruples detection rates of invasive breast cancers in women with dense breast tissue. Molecular Breast Imaging (MBI) is a supplemental imaging technology designed to find tumors that would otherwise be obscured by surrounding breast tissue on a mammogram. Breast density is the term used to describe the variation in dense tissue on a mammogram image. Fatty breast tissue appears more radiologically translucent than dense (fibroglandular) breast tissue. Regions of a breast that comprise fatty tissue will appear darker on a mammogram, while regions that comprise dense tissue appear whiter. Dense breast tissue makes mammograms less efficient and creates difficulty in identifying tumors. MBI is now incorporated into the care model at Mayo for women with dense breast tissue. 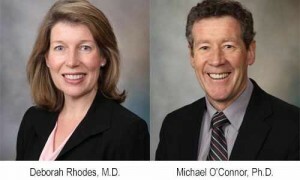 Deborah Rhodes, M.D., and Michael O’Connor, Ph.D., lead the program and have just launched a 10-year outcomes study to validate the technology as an exceptional supplement to mammograms. "MBI produces functional images of the breast, which in my opinion is the direction we need to go to vercome the limitations of anatomical imaging in dense breast tissue," says Dr. Rhodes. "No matter how much you improve your x-ray, at the end of the day it's still an anatomical image." The MBI Program recently was covered in The Wall Street Journal. The article highlighted the case of a woman whose successful surgery would never have been conducted because mammogram screening missed a relatively large and aggressive 7-cm tumor that was found through supplemental MBI. The MBI Program is also good news for minority women. Disparities in the level of awareness and knowledge of breast density varies by race and ethnicity, education and income, according to the results of a Mayo Clinic study published in the Journal of Clinical Oncology. When researchers examined the survey results for race and ethnicity, they found increased breast density awareness among white, non-Hispanic women relative to minority women. Increased awareness was also associated with women with higher household incomes, women with higher education, women who had received a diagnostic evaluation after a mammogram, and women who received postmenopausal hormone therapy. “The results of our study support the need for continued efforts to improve awareness of breast density and its implications on screening among women who are eligible for screening mammograms,” says Dr. Rhodes, the lead author on the study. Mayo Clinic Center for Individualized Medicine was an early funder of MBI activities, and continues to provide support for the program. 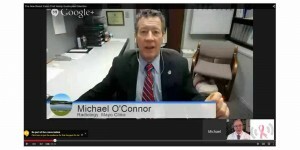 Here, Dr. O'Connor discusses MBI with Breast Cancer Answers host Jay K. Harness, M.D.